Saturday we got up and got ready to go the pier and for some shopping. The whole way down to the car I kept feeling like I just wanted to stay "home" and spend the WHOLE day on the beach. Not go anywhere or have any kind of a schedule. Just the beach. Well we got the kids all ready and we headed down to the garage. As soon as we got to the car Jenn turned to me and said she just felt like staying "home" and spending the whole day on the beach. I swear sometimes it's SCARY how much we think alike! So back to the beach we went! For the WHOLE DAY! It was the best day of the trip. There's not much to tell about the day so I'll just post pictures from our day at the beach. Love his shark necklace! Thanks Jenn! Emily taken a stroll on the beach. Not sure she's having fun by the face she's making?! LOL But I do love that you can see her reflection in the sand...very cool. Waiting on a wave...and here it comes! Seriously LOVE the necklaces *wink* and so did he! Short story: So the next day we tried to take back the necklaces because 2 of the 4 we bought had already broken. Well, Kaleb was in TEARS over having his necklace taken away. I had already taken it into the store and exchanged it for a better necklace, slightly different but still a shark tooth necklace. Well, I got out to the van and he was in tears. Jenn told me what was going on so I took the new one I had gotten for him back into the store and asked her if I could have the other one back-it was too special to trade. So he has his special shark tooth necklace. He and Christopher both wore them to school almost everyday. I like that Christopher is in the background of this one...it's just a cool pic I think. I think Jenn took it...? Kaleb looks like he's ready for battle and Kayleah looks like "say what?!" LOL! 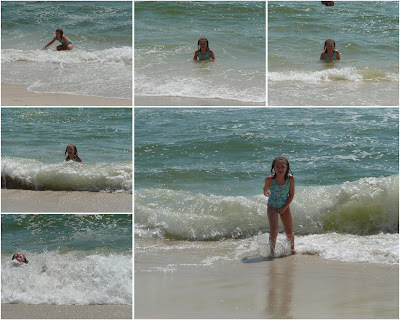 Kayleah spent more time in the ocean than ANYONE on the trip. She loved it. She looks like a serious swimmer in this one. Here Liah "found" a shovel. It became hers. LOL! She is TOO cute with her little anklet and pineapple willy's tattoo. 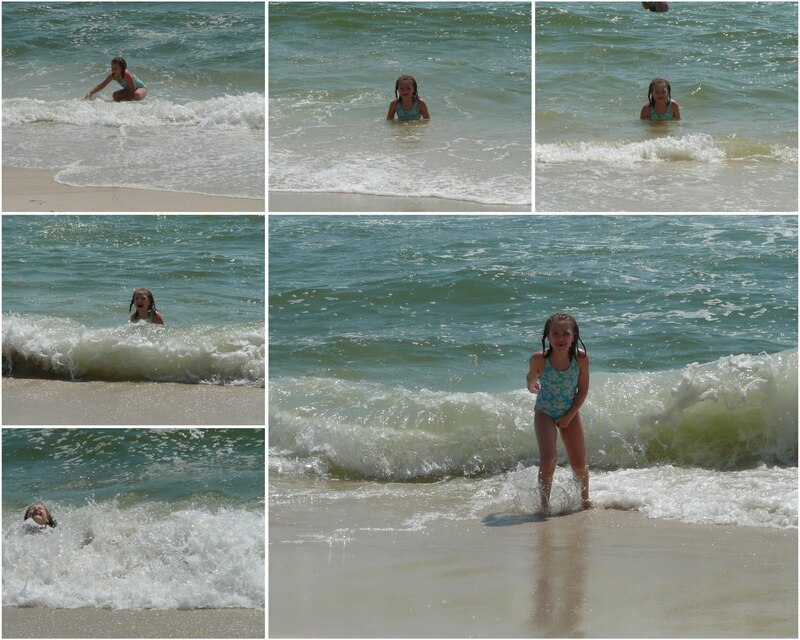 Sarah loved getting hit by the waves. She is also my one that needs a break from the fun every now and again. I think in this picture she was actually pouting. LOL! I DO have one really great story from the day...and it involves Sarah. She had to pee. So I told her to just go pee in the ocean. You know you've all done it before too. *wink* Well the idea to Princess Sarah of peeing herself in the ocean was NOT appealing. She tried to "hold" it for awhile but eventually gave in and peed in the ocean. It. Was. Hilarious. She couldn't "relax" enough to do it at first. And yes, I documented the event...enjoy. LOL! The last picture on the bottom left is JUST after she finally was relieved. TOO funny! After a day on the beach we decided to check out the lazy river. Emily and Isaac were the best of friends this trip...and usually are. This was THE BEST vacation I have ever had!! I loved every second and the kids did too :) I'm glad your kids finally got to see what the ocean was really like...for longer than a few hours...although they still talk about North Carolina :) We have GOT to go back to FLORIDA!! I am the oh-so-proud mother of five energetic kiddos. I discovered blogging a few years ago and love it. For me it's the best way to family journal. So come by often and see what's going on in our lives. Can't wait for the 3rd book...but I'm nervous to read it. My sister says I won't like it.